Following the releases of the “Team Leadership” and “Personal Leadership” applications, which topped downloads on the iTunes business chart, the “Company Leadership” application is designed to help leaders build teams and receive positive results. As the demand for personalized training continues to grow, the Dale Carnegie Training iPhone app series seeks to act as a pocket coach for information. 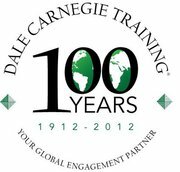 Together, this three-part series seeks to help develop leadership potential through video segments, daily tips, inspiration quotes, activities, self assessments, each of which seek to demonstrate key principles from Dale Carnegie Training. The first of the series, “Personal Leadership,” seeks to teach businessmen and women how to coach a team to peak performance and use the right leadership style for each situation. The second part in the series, “Team Leadership,” seeks to show how to create high-performance teams by delegating, running meetings, enhancing confidence and enthusiasm of team members, and coaching team members for positive results. • Removing barriers that limit communication. • Using a structured approach to solve problems. • Implementing a planning methodology to lead projects. • Handling mistakes made by others in a way that maintains motivation.